If you are reading this blog, odds are that you are a fan of games. Not only because this is a game design blog about the history of game design (I know you read the titles), but also because you would be hard pressed to find somebody that doesn’t enjoy games in one form or another. Games can teach lessons, they can bring people together and, most of all, they are fun! Games today are a daily part of billions of people’s lives, and more new games are being created now than at any point in history. But today I am not going to be talking about these new games, but instead about some old games. Some VERY old games. Did I mention they were old? Some of these games are estimated to be over 5000 years old, and some may be even older than that. These games were played for thousands of years, by some of the most famous historical figures in all of history. And, although they may be very ancient, I believe that there is still a lot to learn from our modern board games’ ancient ancestors. Let’s start our journey through history with the oldest known board game so far discovered – Senet. The oldest evidence of Senet dates it back to around 3100 BC, but the oldest intact Senet board ever discovered is from the Middle Kingdom of Egyptian history (so between 2050 and 1800 BC). While we don’t know all of the rules of Senet, we can determine the basic rules from examining fragments of ancient texts. We know that players each had a number of pawns that they moved around the board by throwing dice, and the winner was the one who removed their pieces from the board first. We also know that the journey of the pawn around the Senet board was seen as a representation of the journey of the soul through the Egyptian afterlife. 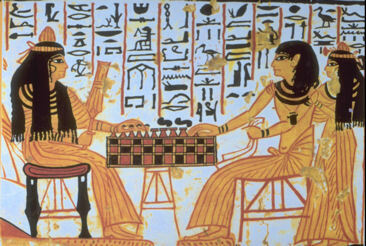 Senet was such a huge part of Egyptian culture and religion that images of people playing Senet can be found in the Book of the Dead, and several Senet boards have been found in Egpytian Pharaoh’s tombs. Like many of the most ancient board games, Senet is a race game. Race games are a peculiar category of board games because they are both incredibly old and very widespread. Race games are generally pretty simple – both players have a number of pieces on the board, and try to get all of their pieces off the board before the other player. Usually players move based on rolling some form of dice, and in many cases there are ways to knock opponent’s pieces off of the board. The size and shape of the board can vary from game to game, as can the path required for the pieces to travel around and off the board. Race games are so common in the ancient world that, according to David Parlett in The Oxford History of Games “all cultures that have games at all have race games”. These games have been found everywhere from Egypt to India to South America, and all these forms are surprisingly similar. The Royal Game of Ur – An ancient Sumerian race game shown in the image at the top of the page. The oldest Ur board goes back to 2600 BC. Mehen – Another Egyptian race game played on a spiral shaped board. Named after a serpent god who’s name means “coiled one”. Patolli – A race game from the Americas that goes back to 200 AD and is one of the oldest know games in the Americas. It was played by the Toltecs, the Aztecs and the Mayans. Patolli is a particularly interesting example of these types of games because not only is it very geographically distant from all of the other known early race games, but it also is a sub-category of these games known as a running fight game. These types of games play very similarly to other race games, with two main exceptions. Firstly, your pieces do not leave the board at the end, but instead keep going around and around. Secondly, the goal is not to get all of your own pieces off the board, but to knock all of your opponent’s pieces off. Patolli is also a great example of another common aspect of these ancient race games – gambling. These games usually relied upon dice or other randomly thrown objects (such as beans, sticks or cowry shells) to determine the movement of the pieces, and this made them prime suspects for gambling. Patolli exemplifies this by baking the gambling into the rules of the game. Both players have six pawns, and at the beginning of the game they have to bet six possessions. Every time a player lost a pawn, they also lost a personal possession! While race games may have been some of the earliest games ever invented, they are also some of the longest lasting. Variations of these types of games have been played continually since they were first invented thousands of years ago, even up to modern day. One of the most influential categories of race games is the family known as the Table games, which are the ancestors of modern day Backgammon. Table games get there name from the ancient greco-roman game Tabula, which means plank or board. Tabula, which dates back to roughly 470 AD, is generally considered to be the direct ancestor of modern Backgammon. It has almost the exact same rules as Backgammon, except that you roll 3 dice instead of 3 each turn and all the pieces start off of the board. Backgammon, the modern version of these ancient table games, is now one of the most widely played games in the entire world. It has international competitions in countries all over the planet, and major tournament wins can have prizes of tens of thousands of dollars. Not bad for a game whose basic rules have been around for thousands of years! Another modern board game with it’s roots in ancient race games is Chutes and Ladders. This game comes from the ancient Snakes and Ladders game which originated in India. Unlike the previous games I have mentioned so far, Snakes and Ladders is completely luck based, with no skill involved whatsoever. Instead of focusing on skill, the original purpose of this game was actually to teach morality lessons to children. Virtues are represented by the ladders, while vices were represented by the dangerous snakes. Another game that is part of the same family of race games as Snakes and Ladders is Pachisi. Pachisi is the ancestor of the modern games Parcheesi and Ludo, and is one of the first known race games to allow team play. It also was played on a cruciform board very similar to that used for Patolli, played halfway around the world. Even after all this time, new versions of the ancient race game formula are still being made and played. A more recent example, which takes full advantage of the mechanics of knocking opponent’s pieces off the board is the Hasbro game Sorry!. In Sorry!, up to four players compete to move their pieces from a starting space, around the entire board, and finally to the ending position, all while trying to knock opponent’s pieces back to start. 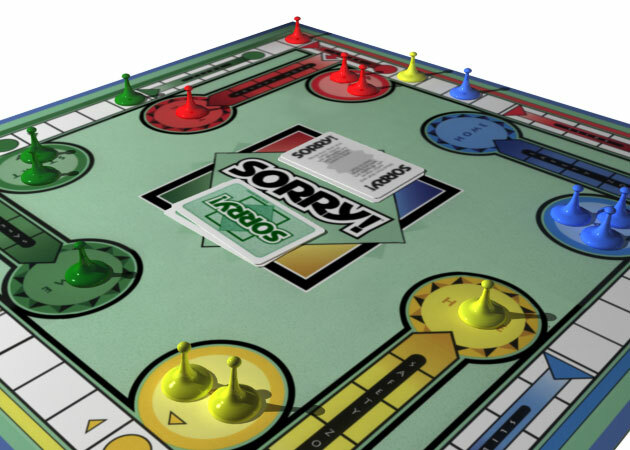 The basic gameplay of Sorry! is very similar to Pacheesi, but it makes a few modifications to the ancient formula. Firstly, it uses cards to control player movement rather than dice. This allows more interesting movement options, such as moving backwards or switching places with opponent’s pieces. Do I really have to type an exclamation point every time? Another (relatively) recent game that shook up the race game formula is Hare and Tortoise. Unlike Sorry!, Hare and Tortoise focused on minimizing the role of luck in the game, instead making it almost entirely strategic. To do so, Hare and Tortoise removed the traditional movement mechanic of rolling dice to move. Instead, Hare and Tortoise allows players to pay the in-game currency, carrots, to move forwards squares. The price of moving increases based on the number of squares moved, which creates a much more strategic game than the more random race games of the past. Despite the innovations of modern race games like Sorry! and Hare and Tortoise, there is still lots of design space to be mined in this genre of game. One area that is full of interesting design space is the movement mechanics of the game. While Sorry! introduced the idea of cards that control the movement of the pieces, I believe that they only scratched the surface of that potential. The idea of allowing players to pay currency to control their movements is also full of possibilities. Other areas that are ripe for exploration include the board itself, and the pawns that are used to play. While race game boards have been found in numerous sizes and shapes throughout time and space, the spaces have generally been pretty interchangeable (with the exception of maybe a few special squares). One way to add variety to this ancient genre is by having more variety of terrain to travel over. You could even use modern board technology to allow players to build the board as they played – racing to the end of a track that gets completed as the players move along it. Another option is to have pawns that all have unique movement patterns or other abilities. Instead of blank faceless pieces, each player could have a variety of tokens, each one distinct from one another that must all reach the end of the board. Perhaps the cheetah token is able to move twice as far as the other pieces, which the Gorilla is able to knock off any opponent’s pieces from the board as it passes them. That’s all I have for this week. I hope you enjoyed my article on the most ancient genre of games in history! If you did, please subscribe to the blog here on WordPress, Facebook, or Twitter so you will always know when I post a new article. If you didn’t, let me know what I could do to improve in the future! And join me next week, when I will be talking about…well, I’m not sure yet. Feel free to give me your article suggestions in the comments below! What is your favorite race game? Are there any major race games that I missed? And are there any more recent race games that you have been enjoying? Do you enjoy these more history oriented articles? If so, what genre of games would you like me to tackle next? I haven’t, but I’ll have to check it out. Thanks for the heads up! Pingback: History of Game Design: Checkmate!